I am only 72, have had a heart attack, and am a great-granddad, with mild memory issues, cognitive and motor impairments. A few years ago, I was stumbling over curbs, and under pressure would get minor shakes. I was diagnosed an early onset Parkie and was offered pills which I felt simply sedated me. I decided to return to the boxing routines I knew as a boy, using a heavy bag, speed bag, double end balls, shadow/shuffle boxing, skipping – and the benefit to my hand-to-eye coordination, to my feet, my focus and balance, my peripheral vision has increased enormously. I know that the boxing has benefited me immensely and brought me up to what I would say is a common level (or better) for old folks. At first I took a bit of criticism for going back into boxing by the medics here – it’s a taboo subject for them – they think I am daft! I encountered your online information and videos, it gave me a lot of encouragement and confidence (and I just love my Rock Steady t-shirt!). It shows that I am not the only “daft” person around. 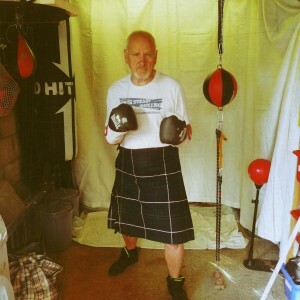 I wear my Rock Steady shirt to the boxing gyms here in Scotland, and I am always telling the champs that I meet here, to keep their guard up, and the bruisers to avoid the head shots. ** Rock Steady Boxing hopes to have an official Scottish affiliate in the near future!